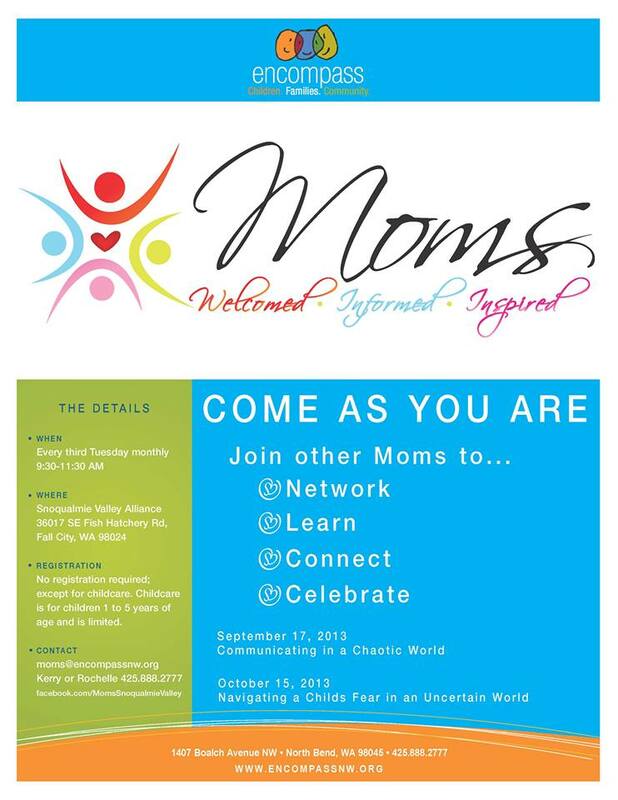 Encompass Partners with New Snoqualmie Valley “Moms” Group; Launches September 17th! On Tuesday, September 17th from 9:30AM until 11:30AM, Moms, a new Valley women’s group aimed at welcoming, informing and inspiring mothers, will be hosting its first meeting at the Snoqualmie Valley Alliance Church, 36017 SE Fish Hatchery Road, Fall City. Moms welcomes all mothers, regardless of religious affiliation and the age of her children, for a morning of camaraderie and learning about topics related to motherhood in the Snoqualmie Valley – and free of charge. Moms was created by a group of women with a deep interest in creating space for moms to network, feel a connection to their community and learn something while celebrating being mothers. No matter where a mom is on her journey, the group recognizes that all moms need support of other mothers. With a shared vision, Encompass partnered to create Moms. Encompass will be providing the bulk of the educational content during each meeting; topics will change monthly. In addition, the Snoqualmie Valley Chamber of Commerce has teamed up with Moms. Up to three chamber businesses will be highlighted each meeting, allowing mothers to get to know local business owners and managers. The September 17th meeting will include a presentation by Nate Perea – Chief Executive Officer of the Snoqualmie Valley Chamber of Commerce, as well as explore the topic of Communicating in a Chaotic World, presented by Kerry Beymer, Parenting Support and Education Manager at Encompass. “I am so excited to be a part of this group and bring the moms of the Snoqualmie Valley a place to come and feel connected and informed about their community. It is something that we have wanted to happen for several years now at Encompass and when we were approached by this group of women and they shared their ideas with us, we leaped at the chance to form a partnership and Moms was created,” says Kerry Beymer. Subsequent meetings will be held on the third Tuesday of each month. For a list of upcoming topics, please visit the Moms website or their Facebook page. On-site childcare is available for $5.00; pre-registration is only required for childcare. Please sign up on the Encompss website.